Standard accessories: Quick release nut, 7 pc. professional cone set, 3pc standard cone set, Large cone with spacer ring for wheels with center bore 97-160mm Weight pliers, Wheel guard. 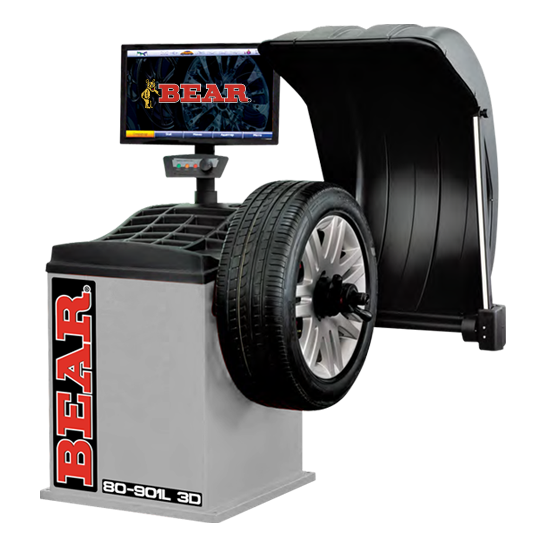 22” Color LED LCD Monitor, Large weight tray, User-Friendly Menu, Guided adhesive weight placement, Automatically starts/stops when hood is lowered/raised, Automatic Data Entry, Static and dynamic balancing modes, Adapter Calibration, Self-diagnosis, Self-calibration, LED light to illuminate wheel barrel for cleaning adhesive weight locations. The software allows up to 3 different operators to use balancer at the same time. Exceptional stability in reading the unbalance between planes. Applied technologies: S-DRIVE, AutoALU, SmartSelector, Rapid Optimization (OPT), Direct3D, Split-weight.